Deliver a fisherman's catch to a friend. I met Mansa fishing in the cold waters of northern Cyrodiil. She asked if I could bring some of her catch to her friend Hannura in Chorrol. Travel to Chorrol and speak to Hannura to bring her the fish. 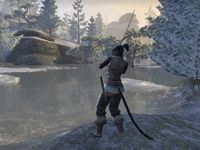 Mansa can be found fishing in a lake east of Fort Dragonclaw. When you speak to her, she says, "It's peaceful here, isn't it? As long as the cold doesn't bother you. The fish here taste much better than those caught in warmer lakes." If you ask her how the fishing is, she will respond, "Better than usual. Might you be traveling to Chorrol? My friend, Hannura, lives there. She loves fish and could use a treat, given Chorrol's troubles. Would you bring her some of my catch?" Once you agree, travel to Chorrol. Hannura can be found working outside. If tell her that you have fish from Mansa, she rewards you and replies, "How thoughtful of you both! Mansa knows cold-water fish are my favorite. A simple pleasure in these troubled times. Please accept something for efforts." After the quest is completed, she will say, "The fish you brought will make a nice meal. Perhaps I should invite some friends over to share." I should travel to Chorrol and find Hannura. Finishes quest Now that I'm in Chorrol, I should deliver the fish to Hannura. This page was last modified on 17 January 2019, at 11:51.